Machine safety is a complex and crucial component of automated production, and one which should come first on every employer's list of necessary considerations in optimising performance. Unless your factory or site is brand new from the ground up, the chances are that it will contain a mixture of plant and equipment, ranging in age from the old faithful to the all-singing, all-dancing, new kid on the block. Machine operators will be a similar mix of long-serving experienced staff and newer hires, all working to a production schedule that is perhaps aimed at profits over personnel. While it may take some time and careful review, however, putting machine safety first is going to optimise performance and profits. Less time will be lost in mishaps and damage, and the risk of injury and accidents will be substantially reduced. Carrying out risk assessment on all equipment, proper training of staff and a thorough review of all documentation are only part of an overall strategy for improving machine safety. They will, however get you started on a policy of "Safety First" that will ultimately benefit the whole operation. Install clearly defined signs to identify safety hazards. Machine safety is not a choice but a requirement in the UK, and falls under several sets of government regulations. The main ones are the Supply of Machinery (Safety) Regulations 2008 and the Provision and Use of Work Equipment Regulations 1998, which can be found on the government's legislation website. In addition to these machine-specific laws, there is also specific legislation to protect workers, under the Health and Safety at Work Acts. 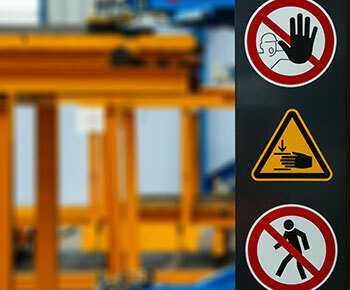 For more information on these important laws and how to comply, have a look at our recent blog on the importance of machine safety. To make sure your premises, plant and personnel are all in compliance, review these regulations and make sure they are documented and available for staff. Check the safety information provided for every piece of equipment, and if necessary, update and disseminate it to all relevant personnel. If you have a proper policy and standards in place that accord with the regulations, this will help to promote vigilance among the workers. Safety at work is a collective responsibility, as this is an environment which is likely to contain hazards such as high pressure equipment and rotating or crushing machinery, not to mention sparks and flying debris. Everyone must work mindfully and be aware of their individual and group environment, especially if they notice any unsafe conditions on the factory floor. Such conditions must be reported and dealt with immediately. Personnel working in close proximity to potentially hazardous machines must be aware of the dangers, and must be properly protected by safety guards. Risk assessment is a key step towards improving machine safety. Hazards should be identified, analysed and neutralised. Machine safety is often closely related to electrical hazards, such as burning and zapping, but operators are also at risk of crushing, maiming and cuts. Making a proper risk assessment should involve identifying the hazards, assessing what harm could be done, and determining how the hazard can be controlled or removed. All machinery on the premises should be assessed in this way, and many areas may emerge where safety improvements can be made. A key component to carrying out upgrades and successful safety improvements is to involve maintenance technicians and the machine operators themselves, and to schedule major works for periods of scheduled shutdown (if any). Operators will sometimes disable a safety system because it is badly designed, in which case improving the design is a better approach than restoring the equipment to its original state. All machine operators and maintenance technicians should be fully trained on each piece of equipment they use, but retraining should also take place after any upgrades or new installation. Everyone in the factory must be made fully aware of all machinery upgrades and changes, with regular reviews to ensure that no employee is untrained or careless. Training and review sessions should also include emergency response training. It is essential and legally mandated by the HSE that specific hazards are identified with signage. Such signs remind employees to think about safety on a daily basis, and also highlight any hazards that they may not have noticed. These include not only specific machine safety components, areas or operations, but also offer personal awareness and protection against general hazards such as fire, electricity, noise, corrosive materials and chemicals. Whether it’s for a newly implemented safety drive, or just to refresh and reinforce existing practices, implementing these five steps to improve the safety procedures in your premises is a necessary and ongoing process to keep your workers safe.